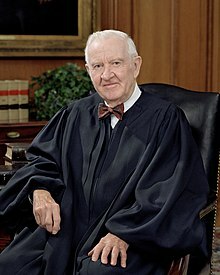 John Paul Stevens (born April 20, 1920) is a retired United States Supreme Court justice. He was nominated by President Gerald Ford in 1975. He voted with minority in Bush v. Gore case (2000). He also voted with majority in Furman v. Georgia case (1976), but later became a death penalty opponent. In 2010, he announced his retirement in the Supreme Court.